Pre-made encaustic medium can readily be purchased but you will save money if you make it yourself. 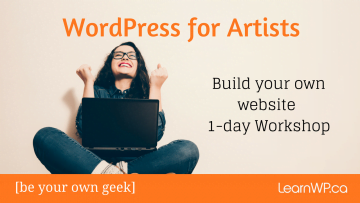 Many artists buy the raw materials and make their own. 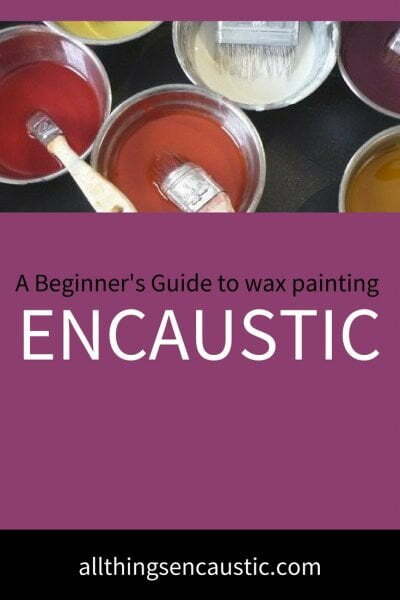 Here’s what you need to know to make your own encaustic wax medium – materials and step-by-step instructions. 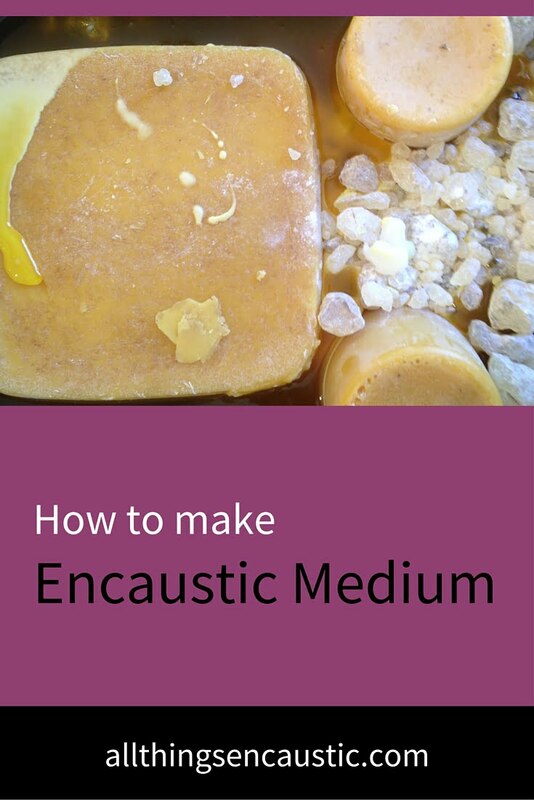 Encaustic medium is made with filtered beeswax and damar resin crystals. Synthetic waxes are commercially available, but beeswax is the type of wax that is traditionally used for encaustic art. In its natural state beeswax is yellow. Bee pollen gives natural beeswax its yellow colour. White beeswax has been mechanically processed to filter out the bee pollen and turn it white. Damar resin is a hard natural tree resin sourced from trees in East Asia and India. It is a sticky sap that oozes from the tree, the trees are not damaged by the extraction process. To prepare encaustic medium, damar resin crystals are added to beeswax. Do not use damar varnish. The addition of damar resin crystals makes the medium more durable than beeswax alone and also serves to harden it and raise its melting temperature. Adding damar resin allows the encaustic painting to be buffed to a higher, more translucent sheen and helps prevent bloom (a white cloud on the surface). a tight-weave cloth such as microfiber cloths, cotton muslin or flannel sheets. If using cheesecloth, as in the video below, make sure you use multiple layers thick enough to capture all of the particulate matter. There is no standard encaustic medium recipe. Different artists and manufacturers will use a different ratio of damar to beeswax. I purchase my encaustic beeswax & damar from Waxworks Encaustics. They use a 5:1 ratio of wax to damar resin crystals. Many encaustic artists start with a ratio of 8 parts of filtered beeswax to one part damar resin crystals and increase the amount of beeswax from there to find the ratio that they prefer. Important: never leave the skillet unattended during this process. Do this in a properly ventilated studio. Measure the beeswax and damar resin in the quantities specified in your recipe (Waxworks Encaustics damar/beeswax comes premeasured 🙂 ). Heat your skillet to 220°F (never above). Use a thermometer, don’t rely solely on the skillet temperature control. I wear disposable gloves and crush the damar resin crystals in a Ziploc bag with a hammer to speed up the melting process. Some people melt the beeswax first, others melt the damar first with just a bit of beeswax, still, others put them in together. Experiment to see how you like to do it. The damar will be very sticky. Stir the mixture until the damar resin crystals and wax are combined. If you are going to strain the medium you will need to ladle it through a cloth into a prepared container. You can use elastic bands to hold cheesecloth in place over your container. Once filtered you can ladle the medium into the muffin cups. Allow the medium to cool then pop them out. Sediment will have collected on the bottom of the pucks. You can heat the bottom of the puck and then scrape off the dirty wax and discard it. Ready to get started? Buy filtered beeswax and damar resin here. Thanks for commenting Darrell, it’s nice to know someone is reading the blog 🙂 Prepared medium is convenient and perfect for beginners but at some point every serious artist will want to make encaustic medium on their own, whether to save money or to just as part of the artistic process. My ratio on medium is 4 beeswax and 1 damar resin crystal, but I still can marking on the surface easily after made it, means is still not too hard. Is that ok? Can I just dip my paper into the medium before it dries? Can you help? I made medium with some pigments and result is fine. But surface isnť smooth on all sides. And on the underside is always little bit different shade, do you know why? I also have the same problem… I did a batch of blue and purple and it is quite translucent and the top of the cake I made is pale versus the store bought medium with color in it (Enkaustic version). Any hints on creating a more opaque medium? I use beeswax and damar resin and add oil paint. are there other pigments or paints that can be added? You wax may be too hot when you pour it. Once everything is melted together turn the heat off and start mixing in your pigment. Mix until the temperature falls to around 150 degrees, then pour into your molds. This will help prevent the pigment from settling in the wax before it hardens. Hope that helped! Also – try using powdered pigments instead of oil paints. It will take a lot of pigment to make an opaque paint. I just made some blue paint sticks last night and used 50g of pigment to 250ml of homemade medium. This makes a very vibrant blue. You’ll want to add powdered pigment slowly, and only once the wax has cooled to under 200 degrees. This will prevent clumps and discoloration. I have a really dumb question. I’m just getting started and I don’t have a thermometer. I suspect the problem I’m having though, relates to temperature. When I put the wax on my gessoed cradle board it is yellow and doesn’t lie flat – brush strokes, bubbles, bumps. I heated the board and that helped a little with the texture but I still am seeing a very yellow cast to the medium. I thought I’d through out this batch of medium and start over – with a thermometer. Do you think that’s my problem? Did I get it too hot? Perhaps you’re not using filtered beeswax? I also find that the wax needs to be hit with heat after applied to the panels to get it smoother. I’ve really embraced the idiosyncrasies of the wax in my work, though. Has anyone on here used encaustic extensively over an acrylic mixed media panel?! Thanks for taking the time to make this post. I have been creating over acrylics for years. Yes, its a no no adding acrylics to the layers or the wax itself…however, my underpainting has been acrylics and my work always turns out! I am going to venture though into oils now and creating my own pigments all thanks to your article!